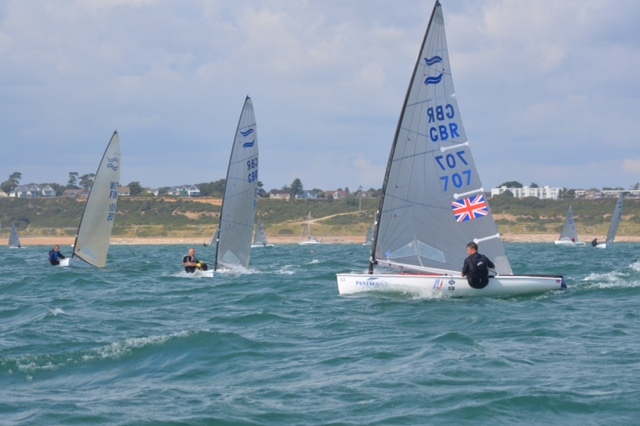 Phil Winston welcomed the 58 entries who were ready to do battle for the British Finn National Championships. Some had travelled from as far as France, Finland and South Africa to compete at the event. It is a high class field with last year’s champion Ben Cornish defending his title along with several faces from the RYA Finn Squad, also present were the whole of the Under 23 and a fine bunch of Masters Sailors some fresh from competing at Lake Garda a few months ago, so competition was guaranteed. 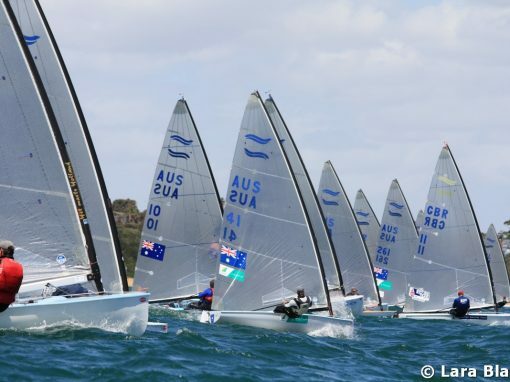 Race officers Andrew Rushworth and Chris Arnell set a windward leeward course in the centre of Christchurch Bay, the conditions to start did not disappoint with 12 to 14 knots coming from the south west. As is traditional with a Finn fleet of this size it took three attempts to get the competitors away. 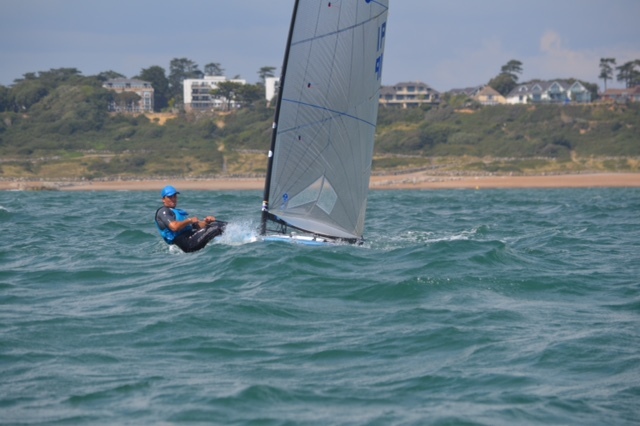 The pin end was favoured by the majority of the fleet and Pete McCoy to full advantage and led to the top mark from Ben Cornish and Henry Wetherell. Downwind Ben worked his way past Pete never to be overtaken, with Henry maintaining his third place at the finish. 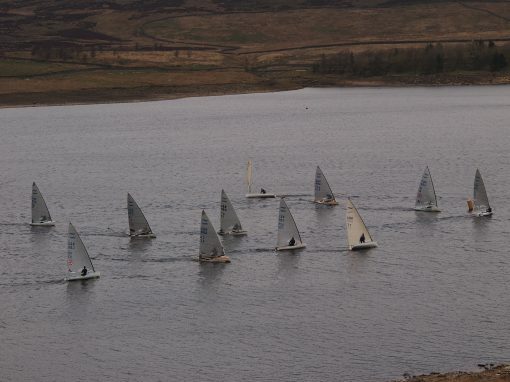 The second race again got underway after three attempts as the tide had begun to ebb pushing the competitors over the line with some casualties under the black flag. 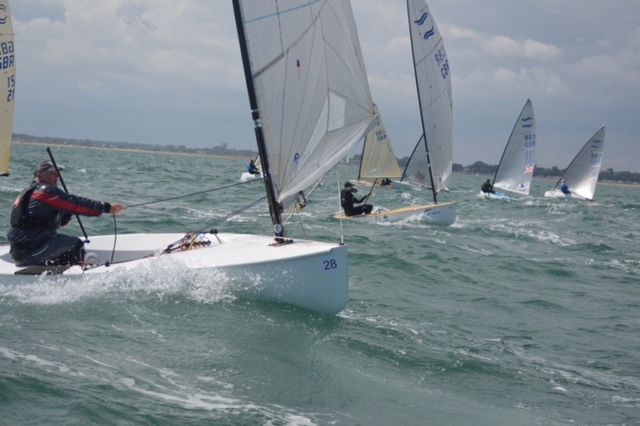 The breeze had built to 14-18 knots as well as the sea state making it perfect sailing conditions for a Finn, if you could hold on!! 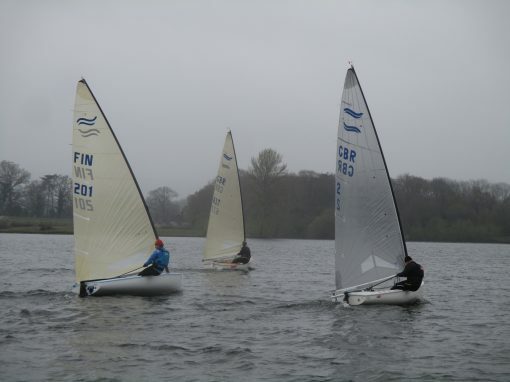 Ben Cornish started again from the pin end to take the lead at the top mark from Pete McCoy followed by Hector Simpson. Downwind though Pete went hard left with the waves and was overtaken by Henry and Hector. At the finish it was Ben, Henry and Hector who took the top three. 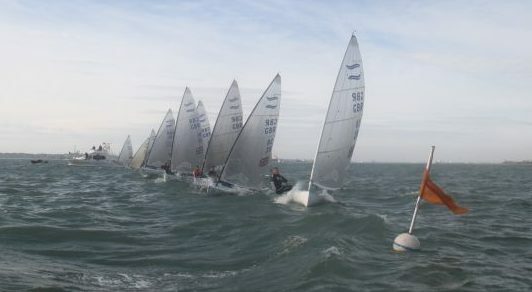 The fleet were welcomed back to Christchurch Sailing Club with a Hog Roast and free beer aptly named `Rule 42` although the champagne sailing condition meant that the umpire for the event John Doerr did not have an opportunity to raise his yellow flag!! Hopefully more of the same for Saturday with three races in the bay scheduled. The fleet will sleep well tonight! !